16 year olds were not the target audience of Disney’s smash hit High School Musical. We were out of range of Disney’s programming by this point–Even Stevens, Lizzie McGuire, and The Proud Family had ended; That’s So Raven and Kim Possible were coming to an end; those of us holding onto the Disney drama periods of our lives (and there were many) had to accept new programs like The Suite Life of Zach and Cody or the star making Wizards of Waverly Place (Selena!) and of course Hannah Montana. Even the Disney Channel Original Movie selection had grown dim for us–looking at a list of films the only ones that stick out are 2004’s Stuck in the Suburbs (starring SNL’s Taran Killam!) and the third Zenon film, which I can’t be entirely sure I actually watched. I’m not sure there’s any evidence that Disney needed a hit, but to gain the attention of 16 year olds in 2006 would have taken something big. And that’s exactly what they did. High School Musical doesn’t have the meaning for me that I’m sure it does for those in Jr. High or early High School when it came out; it was always a guilty pleasure of a watch. And I did certainly enjoy it, let’s make that clear, but I don’t think I would be writing this right now (or would I?) if it hadn’t absolutely blown up youth culture from 2006 to 2009. As 17 year olds we had a party to watch the premiere of the sequel, sure it was fairly ironic, and most people weren’t paying attention, but it was a thing. So here we are 9 years later after the release, Efron has been everywhere and back as a star/troubled ex-child star, the same with Hudgens, and Tisdale is the only one who seems to have any spotlight left at all from the cast of young stars who ruled the world for three years. It was a Friday night and why not watch High School Musical? So we did, interested in how it would hold up aside from this strange nostalgia that sticks with me because of my strange interest in this franchise (perhaps the target audience was 12 year olds, but the problems being dealt with were those exactly like mine and this is why something actually stuck with me in this movie–more on this to come). The Disney Channel (and its rival Teen Nick) is meant to be a soap opera-lite. It takes teenage situations (often adding magical realism to a strangely disproportionate amount of them) and makes them the most serious situations, filled with drama, and angst, while also being so capable of being solved and backed with light and bouncy music. They take place in teen worlds where teen problems are elevated to maximum levels and adults only serve as quirky side characters. High School Musical was never going to exist outside of these tropes and overall it really doesn’t. Adults only offer bad advice (Troy’s dad), set plots into motion (Mrs. Darvis), or are there just to let you know that these kids actually have parents (Gabriella’s mom, Troy’s mom). The whole thing is essentially a giant teenage soap opera set to song and dance. Yet it all kind of works. On the outset, the theme of the film is to break free from the clique that you feel you have to be a part of. This is the theme of roughly 90% of movies about high school and so it’s not that special. Each kid feels pressured to act a certain way and to fit in the realm of each clique (the highlighted cliques are: jocks, theater kids, math geeks, and skaters). Their school is filled with a rigid structure, so strict it’s laughable the lengths students go to in order to keep each type in it’s place–almost reaching a Big Brother like system filled with framing people and computer hacking. The stakes are high and dramatized, but it is a musical after all, where plot points are elevated into literal songs and dances of emotion. High School feels like the most intense period of your life when you’re in it, so why not play this to its highest level? While, again, ostensibly for pre-teens, the themes throughout this and its two sequels (summer jobs, preparing for college) are for actual teenagers going through this stuff. Not gonna lie, when I saw High School Musical 2 I certainly felt something during the Troy and Gabriella break-up song, because that was that period of my life. I’ve talked to numerous others, perhaps too old for the film, that too express relating to its characters and themes. I wouldn’t be surprised if kids–now seniors in high school–find a lot of resonance in these movies now that they are actually dealing with the themes these nostalgic and beloved characters were going through when they first saw it at age 10. But the question we are asking ourselves today is about how well it actually holds up now. As discussed above it does work on a certain level dramatically. It treats high school as a serious place, but it does essentially ignore every adult in the film (Troy’s dad is seriously the worst). 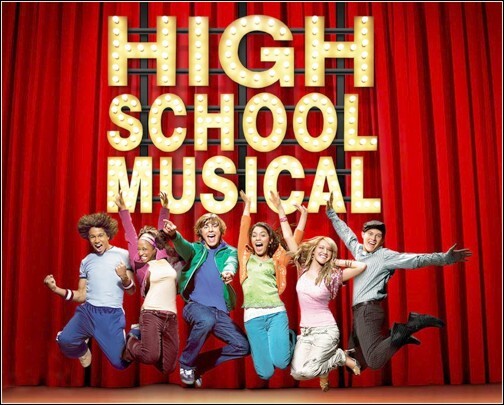 We can’t ignore how cheesy and ridiculous some of its plot lines are, I mean, the film’s catalyst is a New Year’s Eve teen karaoke sing-off where Troy is catapulted into changing his whole lifestyle (as well as his school) by singing one song (watch out jocks, don’t let this happen to you!!!). The acting isn’t the greatest either and its funny because the whole film is about not being one-note in real life, while leaving so many of its characters bare (I’d forgotten how little Ryan Evans is in this film), but the tension it’s star faces is real and makes it worth watching. As far as its musical chops go, it’s decent. The songs and productions are pretty light (I watched the sequel as well and think that coming off the success of the first one the production aspects get better, likely due to a bigger budget and having Disney’s complete trust). They aren’t as big as they could have been and are mostly duets sung on a stage with little to add. The times that they actually do go more Broadway, like “Get’cha Head in the Game” (which I didn’t like those years ago, but think is quite strong now) or “Stick to the Status Quo” are the film at its best both musically and emotionally. “Get’cha Head in the Game” follows Troy’s inner monologue in the midst of basketball practice, showing the pressure he faces as his team’s leader as well as his new found love for drama and Gabriella. “Stick to the Status Quo” is mostly lead by minor characters who, while sitting in the cafeteria, start breaking out into confession about the ways in which they, like Troy, want to break free of the groups which hold them back (baking! dancing! cello playing!). These songs capture the complexity of this high school world, while incorporating catchy and showy musical numbers. I don’t think the movie will attract adults or really is worthy of being in any sort of larger pantheon, but as a cultural phenomenon that captured a group of kids over the course of five years, it stands out, and is deserving of what it became. It’s the family friendly Grease of the 00’s and will live on as that film does today, occasionally appearing on your television Sunday nights and with you intentionally choosing not to change the channel.